This transitional style coffee table is the perfect look for your home or office. 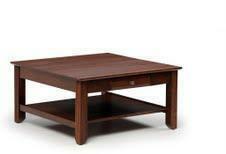 The Amish handcrafted Arlington Coffee Table has a stylish square design that will fit in any home decors. This solid wood coffee table is sure to transform your living room. Choose to order it as an oak coffee table or cherry coffee table or select from our many other options. The hardwood Arlington coffee table comes with one dovetailed drawer on full extension drawer slides. The bottom shelf allows space for storing magazines or displaying collectibles. The beautiful 4" fluted feet add a nice formal touch. Please call one of our Amish furniture specialists with questions on our Amish accent tables and this square coffee table. They are help to talk and learn about your living room furniture needs.